Hello Lovely Readers!! 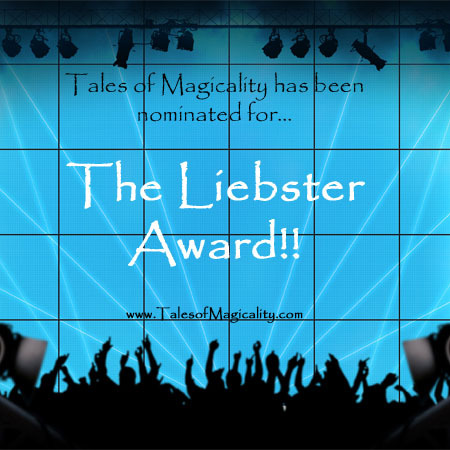 We are super excited and grateful because Jacki the totally amazing blogger over at Flying the Good Flight, has nominated Tales of Magicality for the Liebster Award! We are so honored and stoked all rolled into one!! 2. Answer the Questions given to you. 3. Nominate other blogs with less than 500 followers. 4. Post Questions to be answered by your nominees. 5. Tag & link your nominees & leave a comment letting them know they’re nominated, appreciated, & loved! 1. What do you consider your biggest accomplishment so far in life? For me, I would have to say my biggest accomplishment in life so far is following my true hearts desire. In 2010 I moved cross country from New York to San Diego. I love where I live but I love more that I followed my heart. I’ve taken that leap of faith as an example for me to continue following my heart and inspiration! Well, it may sound funny, but I think my biggest accomplishment in life so far is learning I have control over my moods and learning to keep myself in a happier state of mind the majority of my days the past couple of years….that’s right, it took almost all of my life to get here so that’s why I consider it a huge accomplishment. In all honesty, I really have the Law of Attraction and the creation and recognition of my Magicality Magnet to thank….as well as my Magicality Buddy, Rayna. 2. What are three things that make you smile? My sons smile, Nature and being able to help others. My kids playing nicely together, enjoying loud music in my car with the sunroof open on a sunny day and 4-wheeling my Jeep to our secret camping spot. 3. What is your favorite color & what do you think it says about you? 4. What would you say is the main message behind your blog? I would say the main message of Tales of Magicality is to inspire anyone that needs some inspiration. We are on this journey of self discovery and awakening with You, the reader, so we hope you can relate to what we have to say. Hopefully it inspires you in some way! I would say the main message that Tales of Magicality is trying to express is that we are all human, we are all a work in progress; while it can be easy to get discouraged in life, it is possible to live a more fulfilled, happier life when you are aware of all the wonderful things that come across your path–everything has meaning! Practice makes perfect…and it pays off with a happier YOU! 5. What is the greatest obstacle you’ve overcome so far in your journey? Well, I think the greatest obstacle that I have overcome in my life which offered the sweetest reward on the other side was college. I had a hard time finding my way. After leaving school, taking time off to work full time only to find that I truly missed school and learning, then searching for my right “fit,” I ended up in Lake Tahoe in a tiny Liberal Arts school and eventually met the love of my life while living there. Had I not experienced all those college-related “lows,” I would have never been drawn out west and met my husband. Everything happens for a reason…a good reason. 1) What inspires you to be a better person? 2) What helps you stay centered when things may not be going as smoothly as you’d like it to be? 3) What’s your favorite thing about being a writer? 5) What author(s) inspire you? Thank you again for the honor of this magical nomination! We also are totally grateful to be a part of this awesome, empowering community of amazing people! We hope to connect with everyone as we spread our love, Inspiration and words! Love to you all!